Surly and his friends, Buddy, Andie and Precious discover that the mayor of Oakton City is cracking one big hustle to build a giant yet quite-shabby amusement park, which in turn will bulldoze their home, which is the city park, and it’s up to them and the rest of the park animals to stop the mayor, along with his daughter and a mad animal control officer from getting away with his scheme, and take back the park. KIDS FIRST! Film Critic Dariana A, comments, “With some movies, the sequel is never as good as the original, but with this movie, they are both awesome films. There is never a boring part or unnecessary scene.” See the rest of her review below. The Nut Job 2 is wonderful! With some movies, the sequel is never as good as the original, but with this movie, they are both awesome films. There is never a boring part or unnecessary scene. It keeps you wanting more and gets you really attached about the characters’ lives. The background music really helps keep the story going and makes the chase scenes more suspenseful since there are no silent moments. 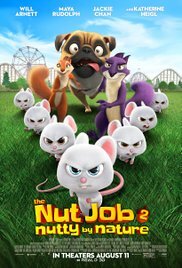 In the film, an accident happens and all the animals who are eating at the nut shop are forced to move back to the park. Unfortunately, Mayor Muldoon (Bobby Moynihan) has some nefarious plans to destroy the park. So, Surly (Will Arnett) and his friends have to find a way to work together to save the park. One of the things I care for in both of The Nut Job films is the animation. I love how you can see every single hair on all the animals and how each one is different. Another thing that I love about this film is the music. That, you can thank Heitor Pereira for. The music goes with the lines and scenes so well, that it truly enhances the story. My favorite character is Buddy because, even though he never talks, he is always there for Surly and it’s funny to see Buddy’s expressions that make it seem as if he’s talking. I also really like the backstory showing Surly and Buddy’s friendship. Another thing I really like is Mr. Feng’s (Jackie Chan) tail because it makes him more intimidating, which adds to his character. My favorite scene is when Andie (Katherine Heigl) starts singing about how the park is their home and they make a joke about how “no one can break into a spontaneous song.” Go watch it and you’ll see! The two messages in this film are to work together, which this movie is all about, and that nothing comes easy. This message comes into place when the animals have to move back to the park and scrounge for food. I rate this film 5 out of 5 stars because of the extraordinary animation, plot and music. I recommend this film for ages 5 to 14 and parents and older siblings will enjoy it too. You can find this film theaters nationwide.